The MAZDA6 is a stylish midsize sedan geared towards the driving enthusiast. It has the looks and the moves but what about power? Well, this 2018 model has received an extensive freshening most notably with the addition of a turbocharged engine and finally Mazda’s debut of Apple CarPlay. Mazda isn’t calling this an all-new model but for all intents and purposes it is. 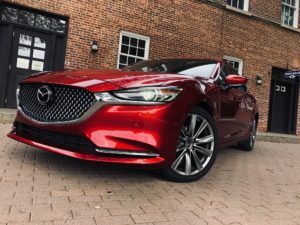 I’ve never really been all in on this car…until now and that’s because it finally feels amply powered and convincingly showcases Mazda’s new premium direction. Huge gains have been made to the way it drives, the way it treats its occupants and even in its already sharp appearance. Man, does Mazda know how to do red or what? This new Soul Red Crystal has finally made its way to the 6 and it’s worth every dime of its $595 upcharge. The new grille, standard LED headlights, and new 19” wheel design sets the stage for a sedan that is punching well above its weight. No longer is the Grand Touring model the highest trim level. There is now a Grand Touring Reserve and then this Signature trim, the most opulent choice. Softer Nappa leather, synthetic suede and Japanese Sen Wood adorn the uncluttered cabin – one that features much better seats that caress your back for optimum long trip comfort. Unfortunately, this rather unappealing Deep Chestnut color isn’t doing it any favors but luckily Parchment is the other color choice. Also worth noting, this little decorative strip on the seat caught me in the back more than once. But, combine last year’s added sound insulation with this year’s major reduction in noise, vibration and harshness levels and you’ve got Lexus-level quietness here. A full overhaul of the chassis delivers a ride that’s so smooth you’d swear you were in something a couple of classes up. And then there’s the new engine. The 3 highest trim levels now come standard with the 2.5-liter turbo-4 from the CX-9 SUV. Feed it 93-octane and you’ll unlock its full potential – a charmingly immediate 310 pound-feet of torque and 250 horsepower that really amplify the lightweight, nimble feel the 6 is known for. The steering is more direct and the handling more balanced meaning it’s fun to drive quotient is ramped up but more so than that, it drives like a luxury car now with an effortless nature to all it does…from around the town driving to hitting that highway off ramp, there’s a new level of composure here that’s definitely palatable. And Sport mode really puts the turbo on notice with even more immediacy. Gas mileage is still a strong suit – checking in at 26mpg in combined driving, and yes 87 octane is acceptable but comes with a reduction in horsepower. The one thing Mazda can’t seem to fully grasp though is the importance of a pleasurable sounding powertrain. The 6-speed auto with a straightforward shifter and little steering wheel paddle shifters is far better than a continuously variable transmission but it still groans like one. If this car would only sound as good as it drives they’d really have something here, so maybe it’s time to fake it like everyone else. The changes Mazda has made here have matured the 6 into a very alluring choice in the segment. Though I don’t love the color or material choices used in this premium level Signature trim the seats are far more comfortable, the cabin is quieter, and the drive has really taken a leap forward in terms of smoothness and power. Overall, the car has this air of refinement to it that you’ll really like. And, finally having CarPlay turns this part-time touchscreen infotainment system into something worth using. The initial batches of 2018 cars didn’t come with Apple CarPlay or Android Auto but starting in September it became a free dealer installed upgrade on all but the base Sport trim. Cars arriving in November will already have the technology installed. As noted in my previous test drives, the unit can be touch controlled as long as the car isn’t moving – after that it’s this knob that gets you around. It’s not perfect but I can better embrace it now. And with this Signature model, you feel very well attended to without being bombarded with buttons and switches. Priced at a very reasonable $36,000, this Signature trim comes with everything Mazda offers as standard. A couple of my favorite new items include the 360 degree camera and heads-up display. A couple of things that are missing: how about a wireless charge pad and a foot-activated trunk. And I love having a switch for the camera so I can activate it when I want. The Bose 11-speaker stereo system sounds like it’s been crafted specifically for this interior, the ventilated seats are a first for Mazda, there are front and rear parking sensors, a reconfigurable gauge display, memory settings and cleverly packaged USB ports inside the rear center armrest. The head lights swivel to better illuminate the road at night, there’s radar cruise control with all of the lane keeping and brake support systems we’ve come to expect in a modern car, and the trunk opens up even further with fold flat rear seats to accept a longer haul. $36,435 is the as-tested price here and it’s all included – extremely well stocked with nearly all of the key luxury amenities that craft a spacious car that invites you to drive it and relax while you’re there.